Drupal Camp LA 2010: A Success! DrupalCamp LA 2010 is now complete. Over two days of Drupal madness. Volacci started the weekend with their Drupal S.E.O. not far from where the camp was going to be. Achieve Internet hosted a small dinner Friday night, which I now call "the calm before the storm." And as the sun was rising Saturday morning for hundreds of our Drupal Campers all the birds were chirping, the skys were solid blue, and the weather felt real good. It was quickly looking to be a good weekend. Saturday and Sunday had awesome content. Our t-shirts were a hit! We even had open bar at the local Pub courtesy of MediaTemple. Overall the camp was a total success and we've already announced the next DrupalCamp LA Summer 2011. This post is going to be short because we are all exhausted for sure and excited to get refreshed so we can play with all the neat Drupal tools highlighted at the camp both days. We have tons of sessions recorded and online raffles you all will want to get in on. So let us get back to you soon with a full rundown. Submitted by John Romine on Mon, 2010-08-09 09:11. DrupalCamp LA: One Week Away! 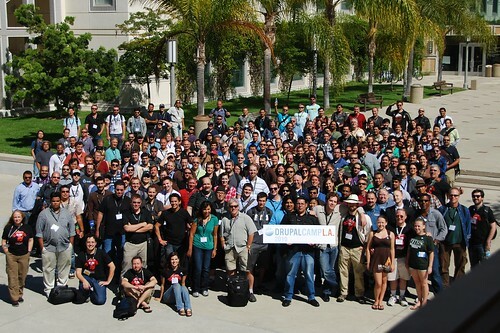 DrupalCamp LA: Less Than Two Weeks Away!